PLANO, Texas--(BUSINESS WIRE)--Aug. 8, 2018-- Cinemark Holdings, Inc. (NYSE: CNK), a leader in the motion picture exhibition industry, announced today that Movie Club, the first exhibitor-sponsored subscription program, continued its growth momentum and reached 350,000 active members, 45 percent of which were new to the exhibitor’s existing loyalty program. 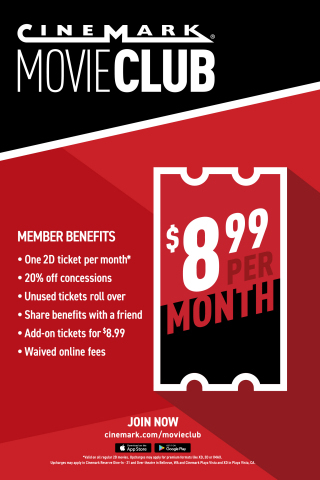 Movie Club members represent approximately 6 percent of Cinemark’s box office revenues and remain highly engaged with a 75 percent redemption rate of Movie Club ticket credits. No risk – members can cancel at any time with six months to utilize unused movie credits.